Local adoptions only--within a 50 mile radius of Quail Valley/Menifee, southwest Riverside County. Feral/barn cats are great micers! We have feral cats available for adoption that were rescued as strays and from other situations where they received no socialization, such as too many cats and/or hoarding. Feral cats are 'wild' offspring of domestic cats and are primarily the result of pet owners' abandonment or failure to spay and neuter their animals, allowing them to breed uncontrolled. A feral cat is an unsocialized cat. Either he was born outside and never lived with a human family, or he is a house cat that has strayed from home or was abandoned and over time has become profoundly distrustful and afraid of humans. Feral cats avoid human contact. A feral cat cannot be picked up by a human and feral cats are very difficult to catch. Even though the cat is wild, it deserves to live. If taken to a shelter, a feral cat will be killed. 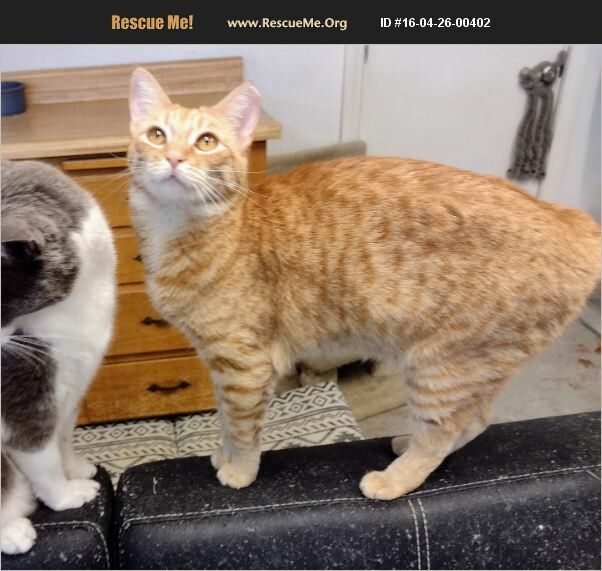 These cats are no trouble and need homes just like any other rescued cats. Feral kittens are easily tamed and adopted, but feral adult cats are usually terrified of humans. Some can be tamed if someone is willing to work with socializing them, giving them time to adjust, one on one attention, TLC and play. These cats are healthy and have been spayed/neutered, vaccinated, dewormed, received flea/tick treatment and tested negative for feline leukemia virus. Since they have been spayed/neutered, they generally get along with other cats. They stay away and have no contact or interaction with humans. They might come near at feeding time, but they cannot be picked up or petted. Pictured is Bowie, gorgeous long haired white cat with one blue eye and one green/yellow eye, whose estimated date of birth is 1/2015. These feral cats are ready and waiting for new, safe, forever homes. Since most people do not want them as house cats, feral cats are ideal residents for a home at a farm, stable, barn, or other suitable outdoor environment with shelter where they are protected and/or safe from coyotes and other predators. Caretaker responsibilities for feral cats include providing daily food and water, protection from the elements and veterinary care. The cat will need a brief period of adjustment. Moving to a new home is stressful for anyone, cats included! After a short stay (several weeks) in secure confinement, the cat will accept its new home and be chasing mice out of your grain with enthusiasm!!! It is recommended and usually works best if 2-3 feral cats are adopted together so that they have companions. Adoption fee is $20 each. Please share/network to help find homes for these cats. If interested, please email us at rescuenrehome@gmail.com with a little info about you and the home you would provide, where you live, etc. Thank you.